The City of Glasgow Police or Glasgow City Police was the police of the City of Glasgow, Scotland. In the 17th century, Scottish cities used to hire watchmen to guard the streets at night, augmenting a force of unpaid citizen constables. 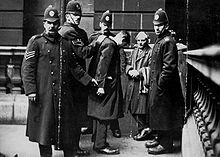 On 30 June 1800 the authorities of Glasgow successfully petitioned the British Government to pass the Glasgow Police Act establishing the City of Glasgow Police. It served Glasgow from 1800 to 1975, when it was amalgamated into Strathclyde Police. It is sometimes described as the first modern-style municipal police force, although due to the original Glasgow force's small size and varied duties (as well as policing they also fought fires, called the hours and swept the streets, thus in many ways more closely resembling the older city watchmen) this title has previously been claimed by the London Metropolitan Police. However, following formal enforcement action by the Advertising Standards Authority, the Metropolitan Police gave a written undertaking never to repeat this claim again. In 1779, Bailies (magistrates) of the City of Glasgow appointed James Buchanan as Inspector and established a Police force of eight police officers. This force failed through lack of finance in 1781. In 1788 six Bailies proposed to establish a Police force and obtain an Act of Parliament to empower them to levy a rate from householders to finance the force. The Bailies displayed vision and innovation in setting out their proposals insisting that the force would be run by a Watch Committee of elected citizens, known as Commissioners. The force would wear uniforms with numbered badges with 'Police' inscribed on them and each member would lodge £50 to guarantee their good conduct. The force of eight would provide twenty-four-hour patrols (supplementing the Police Watchmen who were on static points throughout the night) to prevent crime and detect offenders. The policemen they envisaged would not be mere watchmen and what they had written down was the concept of "Preventive Policing", 40 years before Sir Robert Peel established preventive policing in the Metropolitan area of London in 1829. In February 1789 this force of truly professional police took to the streets. During the following eleven years, Glasgow City fathers tried to get their Police Bill before Parliament, but without success. In the meantime, the small, pioneering, Glasgow police force, led by the Master of Police, Richard Marshall, was struggling to maintain its existence due to lack of the finance that the Bill would have provided. In 1790 the force failed and the City had again to rely on a City Guard of citizens. During the summer of 1800, the Glasgow Police Bill was debated in Parliament and on 30 June 1800, the Glasgow Police Act received Royal Assent. In 1819 Lieutenant Peter McKinlay was appointed as Criminal Officer, Glasgow's first Detective. In 1846 the Glasgow Police merged with the Gorbals, Calton and Anderston Burgh Police. As a result of this, Glasgow Police divided into four Divisions and now numbered 360 officers. New uniforms were issued in 1849, which consisted of a better quality top hat, three-quarter length dress coats with standing collar and nine buttons. Electric telegraph adopted for communication between offices and other police forces in 1861 and in 1878, a horse drawn van was introduced for conveying prisoners. Due to the City of Glasgow Act 1891, the City boundaries were extended to the south, north and west sides of the City. Due to the extension, a system of 14 cast iron Police Signal boxes was installed in the outlying areas. By 1900, the City of Glasgow Police numbered 1355 officers and men. In 1904 the force appointed its first Chief Inspector of Detectives, and the first Detective Constables were appointed. The Old Central Police Office in South Albion Street closed and a new Central Police Office in Turnbull Street opened as Headquarters of the Glasgow Police on 23 March 1906. The force discussed the appointment of Policewomen and on 6 September, Miss Emily Miller was appointed Glasgow's first policewoman. At the end of the war, of the 748 Glasgow policemen who had enlisted, 112 had been killed and a further 33 were reported missing presumed killed. In 1931, cuts in Government benefits lead to marches by the unemployed and riots in Glasgow Green, Saltmarket, and Jail Square. Fifty-one men were arrested. On 1 December 1931, the new Chief Constable Percy J. Sillitoe was appointed and immediately set about re-organising the force. Sillitoe introduced the first checkered cap bands to any officers then issued caps (most constables & sergeants were still issued traditional helmets until 1952). Popularly known as the 'Sillitoe Tartan', these black and white chequered cap bands were based on those featured on the military's Glengarry headress, and are now used by almost every police force in the United Kingdom, and a number of other police forces around the world. Glasgow's first radio patrol car system was put into operation in May 1936. In 1939, on the outbreak of Second World War, the Glasgow Police prepared and established the Air Raid Precautions Service. Many serving police officers joined the Armed Forces. In 1942 Chief Constable Sillitoe was knighted and resigned in 1943 to take command of the Kent Constabulary. In 1945, Jean Malloy became the first woman inspector of Police in Scotland. ^ "Scotland's First Woman Police Inspector". The Glasgow Herald. 7 June 1945. p. 3. Retrieved 25 January 2019. ^ "River Clyde Police Force (MS Murray 594 Item: fol. 6)". Website of the University of Glasgow Library. University of Glasgow Library. Archived from the original on 30 April 2013. Retrieved 5 January 2013. ^ "River Clyde Police Force". Website of the University of Glasgow Library. University of Glasgow Library. Archived from the original on 14 May 2013. Retrieved 5 January 2013. ^ "THE FIRST 100 YEARS". Website of the Glasgow Police Historical Society. Glasgow Police Historical Society. Retrieved 5 January 2013.